There's a lot of special reasons, not only for this Stuff I Like Special Edition, but also for the card being featured. I'm guessing a whole lot of you view this card and think "Ben Petrick"? I can see why you would think that. In the history of the MLB, Ben was never marketed as the next greatest thing the way Harper, Strasburg, Daisuke and others have been over the past few years. Ben was a 2nd round pick by the Rockies back in 1995. 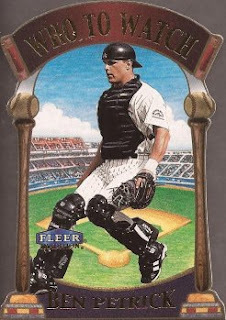 Two sport star at high school, Ben went to the minors, and through a little luck and injury came to the bigs and made enough of a splash to be considered as the catcher of the future. Things happened, though. His numbers started dropping. Ben was traded to Detroit and then quietly retired in 2004. His career stats are nice but the game wasn't working for Ben. Or really, Ben's body wasn't working for the game. Up until about 6 weeks ago, I can be honest and say I have never heard of Ben Petrick. Now, I am slowly working towards a complete collection of the few cards out there of Ben. Why? Well, I was a bored night after reading all the blogs that I decided to jump over to ESPN and see what OTL or E:60 video I could find. Getting to their site, I couldn't miss a link to a story about Ben and the reason Ben had to give up the game. Ben was diagnosed with YOPA - Young Onset Parkinsons. I have this fondness for people like that. See, my wife also has Parkinsons. Ben was diagnosed a full ten years earlier in his life than my wife, but they both got the same basic news: things will only get worse. Go back, now, and look at Ben's career stats. This is a guy that did all that, in the show, with Parkinsons. It's a bit more impressive to think you could get a hit off of Randy Johnson when you can barely write your name. Ben did the best he could, but ultimately the disease decided the way his life would go. What caught my eye most about that ESPN article was the DBS (deep brain stimulation) he received. This was a procedure my wife and I have been talking about, on and off, for years, and finally decided this is the year we are doing it. If you read about what it is (and feel free to play doctor here - Helen is quite the looker), this is not something you just decide on a whim. So every chance we get, we try and find real people and talk about the procedure. Ben had the procedure twice, so I shot an email to Ben from his website, hoping for a response. Ben replied a day later, and has been nothing but a wonderful person to talk with. He has patiently answered question after question, bringing the surgery down from this awe magical wonder to a knowledgeable procedure. Hearing the real life preparation and the after surgery living has taken a ton of fear out of the operation. Don't get me wrong - I don't see this as a walk in the park. But I have an understanding of the other side. I just don't have the DBS company pamphlets to rely on and trust. We know what will probably happen before, during and after, and that eases a lot of stress. So first - thanks Ben. I know I said it in email a couple times, but being open about life and the surgery has helped Kath and myself be ready for tomorrow. I'm going to go out on a limb and say you are a great friend for being there for us. I'll let you know when the surgery is done. My door is always open for you and your family if you are ever in the area. And second, anybody reading this that would like to pray, or think good vibes for my wife tomorrow during the operation, we will gladly accept them. It may be a few days before I post anything even slightly card related, but I think you all will cut me some slack. Now you see how our loss from yesterday couldn't have come at a more inconvenient time. She won't be around to take part in this new chapter of our lives. It stinks, and it hurts and we miss Munchi so. We'll be okay, though. And we are as ready as we can be for tomorrow. Bring it! Holy cow! I read the article about Ben in ESPN magazine a couple weeks ago and started picking up his cards as well. My Grandmother had Parkinsons and while it wasn't YOPA it obviously made an impact. I am working on a post myself but with your connection to the disease, I am glad you beat me to the punch.